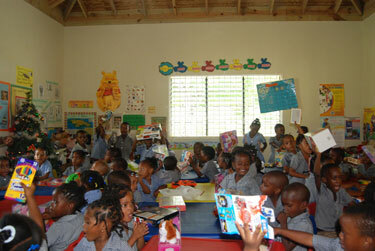 I brought a suitcase filled with school supplies on my recent trip to Jamaica. It weighed 36 lbs. We stayed at the Sandals Resort in Whitehouse. I was looking forward to visiting a school and delivering my supplies. Unfortunately, the day they deliver to the schools was a day that the school was closed for a holiday. They suggested I could leave the supplies and they would be sure to get them to the schools. They could tell I was disappointed about not visiting the school, as I am a retired elementary teacher and taught for thirty five years. I was so excited about the possibility of visiting the schools and visiting with the children. 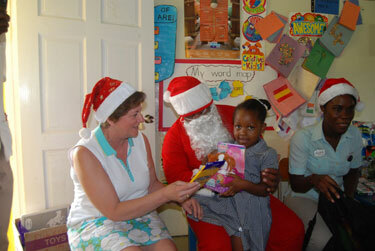 Knowing my disappointment, the staff invited my husband and I to go on their volunteer trip to the Bluefields Basic School, where they were handing out Christmas gifts. Someone dressed as Santa and they also gave the children cake and ice cream. My husband and I were Santa’s helpers, giving out school supplies, as well as helping Santa and serving food. What a joy it was to see those big eyes filled with awe.